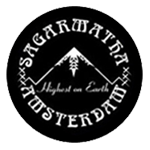 Sagarmatha Seeds - Black Buddha. Free US delivery. The holy lineage of Hindu Buddha and Black Domina created the Ganja godchild of Black Buddha. A cerebral smoke with exotic flavor makes every worshiper a true believer. Solid gigantic heads adorn the plants, large crystal covered calyxes envelope the buds. You will want to pray to this deity 4 or more times a day.